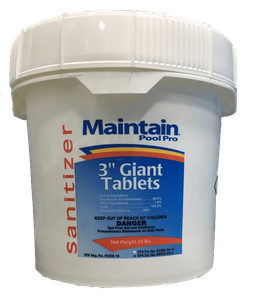 Maintain's Giant 3 inch Chlorine Tablets are slow-dissolving 8 oz. tablets that offer 90% available chlorine for effective sanitizing. This product is an ideal way to continually sanitize pool water. They are perfect for dispersing with floaters, automatic feeders, or skimmers.